Government Technology is a digital magazine covering information technology’s role in state and local government. The digital magazine is recognized for its in-depth coverage of IT case studies, emerging technologies and the implications of digital technology on the policies and management of public sector organizations; Government Technology chronicles the dynamics of governing in the information age. 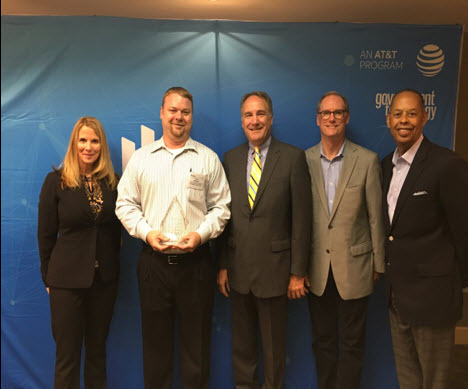 Recently, Government Technology and AT&T launched a nationwide platform for special districts that includes a regional and national awards program with three (3) categories to recognize IT innovation and leadership. An evaluation committee reviews the nominations received in the categories of Technology Innovation: Citizens, Leadership and Operations. The evaluation committee selects awards recipients for each category in five (5) regions of the country. Awards are presented at Special District Summits held in each region at various times during the year. Fort Bend County Levee Improvement District No. 2 (FBCLID2) submitted a nomination for the Southwest region in the category of Technology Innovation: Operations. This category recognizes special districts that have utilized technology to improve internal operations, such as efficiency and productivity improvements, cost reduction, enhanced security, improved processes and advanced sustainability, etc.